Social Skills for Children by Vicki Tillman, MA . 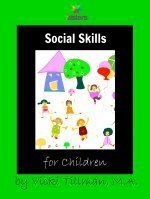 In this 15-page booklet, Vicki not only describes ten of the most important social skills for children, she includes practical ways to help your children learn these skills. Click here to view an excerpt from Social Skills for Children.